‘Telephone’ had become a very important part in Hindi movies….There are many songs where this situation is shown….Hero and Heroine talking in the phone and singing a song…..The trademark ‘telephone’ song is from none other than Patanga released in 1949….C.Ramchandra and Shamshad Begum’s magic created…..
‘Mere Piya Gaye Rangoon, Kiya Hai Vahan Se Telephone’…. Mere Dil Ki Dhadkan Kya Bole – Anhonee . BHARAT VYAS – YE KIS KAVI KI KALPANA…. A lyricist who deserved much more in his life, but didn’t get what he deserved…A lyricist who should be amongst the top 10 lyricists of all time …The one and only Bharat Vyas. Born on 18th December 1918, in Bikaner district of Rajasthan, Bharat Vyas completed his higher school studies and later completed his B.Com degree. Bharat Vyas came to Bombay in the early 40’s. During that time, Bharat Vyas had the dream to become a director and that was the main goal of his life. But, destiny took him to become a lyricist. He did direct movies, but that was much later in his life. His first movie as a lyricist was Duhai, which released in 1943. The film had a total of 9 songs. It starred Ansari, Shanta Apte and Noorjehan and it had 3 music composers – Pannalal Ghosh, Shanti Kumar and Rafiq Ghaznavi. The same year, saw the release of Prem Sangeet, in which Bharat Vyas penned as many as 10 songs, under the music direction of S.K Pal. This movie had some fantastic songs rendered by Amirbai Karnataki. Also, in this movie Bharat Vyas himself sang few songs. One was ‘Mein Aagre Se Jhoota Laaya Re’ (with Shanta Takkar) and ‘Ghaayal Karke Humse Poochti Ho’. Bharat Vyas once said in an interview ‘Apni Dharti Apna Hi Aakash Paida Kar, Apni Mehnat Se Apna Jahan Taiyar Kar’. This is what he believed in. To be successful, we ourselves have to work hard and follow the path in the right way and he took the right path. In 1943, Bharat Vyas also penned a patriotic song ‘Hamara Pyaara Hindustan’ for the movie School Master, which was composed by Ninu Majumdar. In 1944, Bharat Vyas penned 2 songs, for the movie Man Ki Jeet, which was composed by S.K Pal. The songs became popular in the radio. The 2 songs were ‘Chip Chip Kar Mat Dekho’ (which was rendered by Bharat Vyas himself with Shanta Thakkar) and the other song was ‘Ae Chand Na Itraana’. 1945 saw the release of Ghulami in which Bharat Vyas wrote a devotional bhajan ‘O Geeta Ke Bhagwan’ which was rendered by himself with Renuka Devi and he sang one more song in this movie ‘Is Nashwar Sansaar Mein’..(Songs were composed by SK Pal). 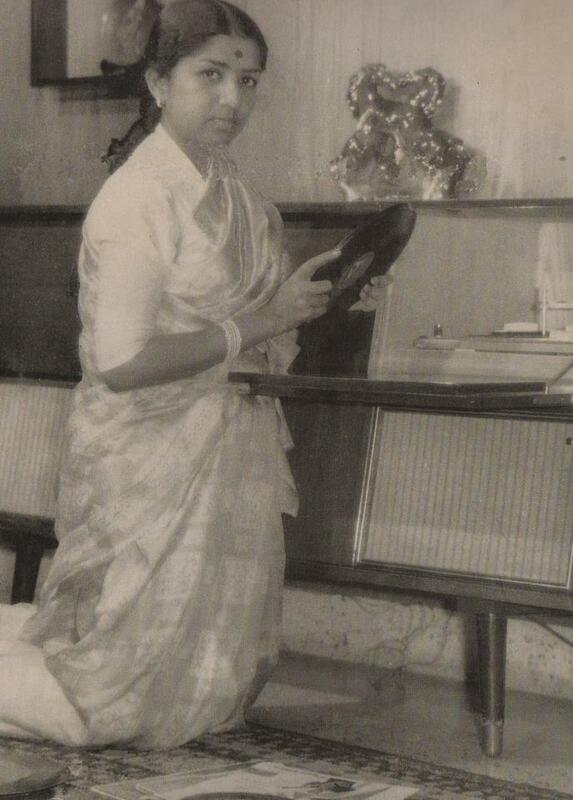 Bharat Vyas’s association continued with SK Pal in 1946 for the movie ‘Prithviraj Samyuktha’ and in Meerabai(1947), in which Bharat Vyas rephrased the lyrics of Meerabai in a song form. In 1948, Bharat Vyas worked with DC Dutt for the movie Anjana. He penned songs like ‘Rhumjim Barse Nain’ (Geeta Dutt), Ab Kis Nagari Jaao Re (Shankar Dasgupta), Sab Nagari Dhoond Phiri (Shankar Dasgupta, Geeta Roy), Dil Ka Geet Aayenge (Geeta Roy) and ‘Mujhe Kuch Yaad Aata Hai'(Geeta Roy). The same year saw the release of Chandralekha, here Bharat Vyas worked with S.Rajeshwar Rao, in which he penned songs like ‘Nache Ghoda Naache’ (Geeta Roy) and ”Saanj Ki Bela’ (Moti BA, Uma Devi). In 1949, Bharat Vyas tried his hands in direction and directed his first movie Rangila Rajastan, but the movie did not succeed. In this movie, he was also one of the composers along with SK Pal and BS Kalla. In this movie, Veteran Composer Snehal Bhatkar too sang few songs. After that, he associated with Khemchand Prakash in ‘Rhimjim’ (1949) and penned songs like ‘Aaye Din Sawan Ke’, ‘Jagmag Jagmag Karta Chand’, ‘Na Tum Aaye Na Neend Aayi’, etc. Jagmag Jagmag Karta Chand was very popular in Radio Ceylon and it was on of Kishore Kumar’s earliest hits. Their association continued in Sawan Aaya Re(1949), Shri Ganesh Janma(1951) and Tamasha which released in 1952, after Khemchand Prakash left this world. In Ganesh Janma Manna Dey too composed some of the songs as Khemchand Prakash passed away after composing few songs. If there was one film-maker with whom Bharat Vyas had a very successful partnership, both in terms of quality and popularity, it was V. Shantaram. Their association started in 1956 with Toofan Aur Diya and continued till Chaani in 1977. Vasant Desai and Bharat Vyas came together in ‘Toofan Aur Diya’ (1956), which was produced by Shantaram’s Rajkamal Films.It had some nice songs by Geeta Dutt and Lata Mangeshkar. My favorite is the Lata-Geeta duet ‘Meri Choti-Si Bahen Dekho Gahne Pahen’. Then came the movie Do Aankein Barah Haath, which is not only considered a classic as a film, but which also had some of the best songs of all time. Vasant Desai was again the music director here. The 1st song was ‘Ae Malik Tere Bande Hum’ which is even today rendered as a prayer in many schools, colleges and on special occasions or patriotic functions. Lata’s evocative rendition, awesome composition by Vasant Desai and spellbinding lyrics penned by Bharat Vyas, have made this song immortal. The male version of this song was sung by V.Shanataram. ‘Saiyan Jhooton Ka Bada Sartaj Nikla’ too was a super-hit song of its time. One of the finest lullabies written till date ‘Mein Gaoon Tu Chup Ho Ja’ rendered by Lata is simply out of the world. The wonderful duet of Manna Dey and Lata ‘O Umad Ghumad Kar Aayi Re Ghata’ is again mindblowing and the song ‘Tak-Tak Dhoom Dhoom’ is again excellent. This movie had everything to be perfect and lyrics by Bharat Vyas brought a new life to the songs and all the songs are popular even today and will stay memorable in the minds of music lovers for years. Bharat Vyas’s next film with V. Shataram was also a musical success. Navrang (1959), became a very big hit and had some of the finest songs rendered, composed and penned till date. C.Ramchandra’s compositions were universally appreciated. There were total 12 songs in this movie. Some of the most popular songs were ‘Tu Chhupi Hai Kahan’, ‘Shyamal Shyamal Badan’, ‘Kaari-Kaari Andiyari Ki Raat’, ‘Tum Mere Man Mein Tori’, ‘Aadha Hai Chandrama Raat Aadhi’. The next magnum opus that came out of the Bharat Vyas – V. Shantaram – C. Ramchandra association was Stree. Based on the story of Shakuntala, each and every song of this film was a lyrical masterpieces. To stay true to the milieu of the film, Bharat Vyas employed a very literary language in the songs using words in shuddh hindi that were mostly unheard of in film songs, and also very fresh similes and metaphors. ‘Aaj Madhuvaataas Dole’ is lyrically the highpoint of this film. Other songs like ‘Kab Aaoge Pran Piya’ (Lata), ‘Jhilmil-Jhilmil Lehron Ka Aanchal’ (Lata), ‘Jhoom Raha Hai Rom-Rom’ (Asha), ‘Tu Hi Mera Sahara’ (Lata) became very popular. The next film where Bharat Vyas worked with V. Shantaram was Ladki Sahyadri Ki, where Vasant Desai was the composer. Neither the film nor the songs gained popularity, but this soundtrack can boast of a song sung by Pt. Jasraj. Next came Boond Jo Ban Gayi Moti, where Satish Bhatia was the music director. ‘Ye Kaun Chitrakar Hai’ sung by Mukesh can be considered among the finest songs written by Bharat Vyas. It is visual poetry at its best. Bharat Vyas’ association with V. Shantaram continued into the 70s with PInjra (music by Ram Kadam) and Chaani (music by Hridaynath Mangeshkar). The collaboration between Bharat Vyas and V. Shantaram also led to another significant association – that of Bharat Vyas with Vasant Desai. Apart from the films with V. Shantaram, Bharat Vyas and Vasant Desai worked together in many films, some of which was musically and lyrically very strong. After the great Do Aankhen Barah Haath, Bharat Vyas again worked with Vasant Desai in Mausi (1958), in which Lata solo ‘Meri Godi Mein Gopala’and Talat-Lata duet ‘Tim Tim Taaron Ke Deep Jale’ became quite popular. This was followed by Goonj Uthi Shehnai that is one of the most popular Vasant Desai soundtracks of all time. It had some of the finest songs composed by Vasant Desai and penned by Bharat Vyas. Each song had its own flavor. ‘Dil Ka Khilona Hai Toot Gaya’ (Lata), ‘Ankiyan Bhool Gayi Hai Sona’ (Lata, Geeta), ‘Keh Do Koi’ (Rafi), ‘Jeevan Mein Piya Tera Saath Rahe’ (Rafi, Lata), ‘Teri Shehnai Bole’ (Rafi, Lata), ‘Haule-Haule Ghoongat Pat Kole’ (Rafi, Lata) and ‘Maine Peena Seekh Liya’ (Rafi) are popular even today and quite often played in Radio. Then came ‘Sampoorna Ramayana’ which had some fabulous songs rendered by Lata and Mahendra Kapoor. All the songs were penned by Bharat Vyas in this movie. ‘Badalo Barso Nayan Ki Kor Se was probably the first song where one heard the word ‘kor’ (Bharat Vyas repeated it in another song in Bharat Milap). His pen expressed the plight of women in general and Sita in particular in the Lata-Asha duet ‘Hum Ramchandra ki Chadrakala Mein’. He worked with Vasant Desai later in Amar Jyoti (1965) which had some great numbers by Lata, Rafi, Mahendra Kapoor and Asha. My favorite is the Rafi solo ‘Woh Phoole-Phoole Phirte Hain’ and then they worked again in ‘Bharat Milap'(1965), noteworthy for the melodious Lata-Mahendra Kapoor duet ‘Chandrama Ja Unse Keh De’. Now, let’s talk about the combination of S. N Tripathi and Bharat Vyas which would rank among the best Music director – lyricist combination in terms of quality and quantity. SN Tripathi and Bharat Vyas were two sides of the same coin and always gave their best, no matter what. Their association started with Durga-Pooja(1954), where Bharat Vyas penned 3 songs– ‘Mere Man Mein Magan’ (Rafi, Asha), ‘Mera Ho Balidan’ (Asha Bhosle) and ‘Gali Gali Mein Phiru Dhoondti (Asha Bhosle). Then came the movie Janam Janam Ke Phere (1957). The most popular song of the movie was ‘Zara Samne To Aao Chaliye’ rendered by Rafi and Lata. 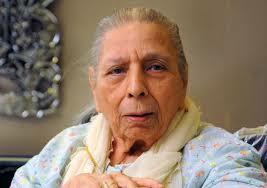 It was the surprise Binaca Geet Mala chart topper in 1957. Some of the finest songs in this movie were Lata’s ‘Aaj Naag Tohe Man Mein Basa Loon’, ‘Baj Rahi Shehnai Dekho’, ‘Raah Se Dharam Ki Hatanewala Kaun’. Also good were the Geeta Dutt-Manna Da duet ‘Rangbhare Phoolon Ki Joom Re Daliyan’ and Rafi-Shamshad Begum duet ‘Aaj Mohan Milan Ki Bela’. Then they came together in Kavi Kalidas (1959), which had some great songs. Bharat Vyas was a master when it comes to ‘Shudh Hindi’ lyrics and also he was a master to write any kind of devotional songs. In this film he translated the essence of Kalidas’s Meghdoot in ‘O Ashadh Ke Pehle Baadal’. 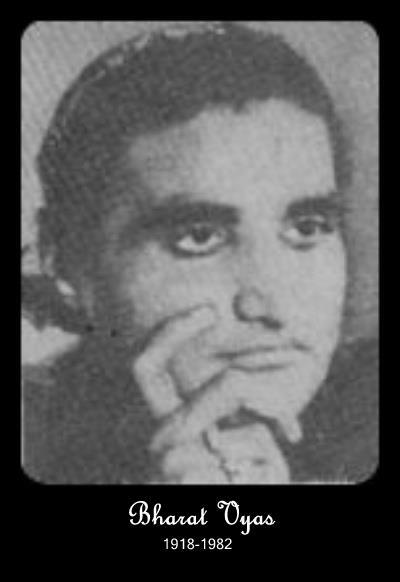 Some of the other songs in Kavi Kalidas were ‘Door Desh Se Koi Sapera Aaya’ (Geeta Dutt), ‘Mein Tho Janam-Janam Ki Pyaasi (Lata) and ‘Un Par Kaun Kare Ji Vishwas’ (Rafi, Lata). The entire soundtrack was a treat to listen. ‘Rani Roopmati’, which had 12 songs penned by Bharat Vyas, too showcased some of the finest songs of SNT-Bharat Vyas duo. Some of the great numbers are ‘Raat Suhani Jhoome Javani’ (Lata), ‘Aa Laut Ke Aaja Mere Meet’ and ‘Phool Bagiya Mein Bulbul Bole’ (Rafi, Lata). Again, this was a very popular soundtrack of its time. Bharat Vyas and S. N Tripathi continued to work together in Chandramukhi (1960). My favorite songs in this movie are ‘Nainon Se Nainon Ki Baat’ (Lata) and ‘Manbhavan Sangeet Suhavan’ (Manna Dey). ‘Lal Qila’ (1960) too had some of the beauties, especially the Lata solo ‘Pyara-Pyara Yeh Sama’ and ‘Ja Re Gokul Ke Natkat Chor’ (Rafi, Lata) which are my top favorites. Their combinaton continued in ‘Sinaldeep Ki Sundari’. My favorite is the Lata solo ‘Meri Preet Ke Geet Rangile’ and Rafi solo ‘Preet Mein Dukh Hi Dukh Hai Pyare’. Then came, Veer Durgadas, where my favorite is the Manna Dey solo ‘Badhe Chalo, Badhe Chalo’. Some of the other movies in which S. N Tripathi and Bharat Vyas came together are ‘Jai Chittor’, ‘Mahasati Ansuya’, ‘Sati Sulochana’, ‘Shri Krishna Leela’, ‘Naag Mere Saathi’, ‘Naag Champa’ and ‘Shri Jagat Janani’. Bharat Vyas continued his work in the 70’s for movies like ‘Baalak Aur Janwar'(1975) (with Chitragupta), Chaani (1977) (with Hridynath Mangeshkar), Chhota Baap(1977) (with Laxmikant Pyarelal), Do Chehre (1977) (with Sonik-Omi), Karm (1977) (with RD Burman) and few other movies. His last released movie was Krishna Krishna released in 1986 which had music by Shankar Jaikishan. Bharat Vyas left this world on 4th July 1982. For me, He is one of the most prominent lyricists and he penned maximum songs for historical and mythological movies, and surely deserves a place as one of the top lyricists of all time. Very few people are aware of the contribution of ‘Umar Ansari’ to Indian Cinema…. Umar Ansari penned 2 songs for this movie….Composed by Ghulam Mohammed Saheb….A melody cannot be better than this….Lata’s sweet and melodious voice takes this song to a different level…A decade where whatever she sang, turned out a platinum…Enjoy this rare gem….